Objective To measure the increases in resource utilization and hospital charges associated with the evaluation of contaminated blood cultures obtained from emergency department patients at risk for occult bacteremia. Setting Emergency department of an urban, university-affiliated pediatric referral center. Patients Children aged 3 to 36 months with blood cultures positive for bacterial growth obtained between January 1994 and October 1996. Main Outcome Measures Increased resource utilization related to contaminated blood culture follow-up, including telephone contact, return emergency department visits, additional diagnostic tests and therapies performed at reevaluation, and hospital admissions. Hospital charges for these additional services were tabulated. Results Of 8306 children who had blood cultures drawn, 491 (5.9%) had positive findings. Four hundred eighty-five (98.8%) of these were available for review. Two hundred seventy-six (57%) of 485 were excluded from final analysis. Of the remaining 209 patients at risk for occult bacteremia, 85 (41%) had cultures that grew contaminants only. Follow-up of these 85 patients generated 106 telephone calls, 49 return visits to the emergency department, 102 additional diagnostic tests, 18 doses of parenteral antibiotics, and 12 hospital admissions with a combined length of stay of 24 days. This resulted in additional charges of $78,904, or an additional $642 per true pathogen recovered. Conclusions Contaminated blood cultures obtained from children at risk for occult bacteremia lead to substantial increases in resource utilization and hospital charges. These untoward effects should be accounted for in formal decision analyses regarding the management of occult bacteremia. Previously published decision analyses of strategies for the management of children at risk for OB paid varying degrees of attention to the effects of contaminated blood cultures on total cost.16-19 All must agree, however, that as the blood culture contamination rate increases (ie, the specificity of the blood culture decreases), the attractiveness of any strategy that employs blood cultures decreases. The purpose of this study was to measure the increases in resource utilization and hospital charges incurred in evaluating contaminated blood cultures obtained from children in the ED at risk for OB in order to quantify the negative consequences of obtaining blood cultures in this setting. This study was performed at Children's National Medical Center in Washington, DC, an urban, university-affiliated pediatric referral center. Although no formal policy exists in the ED regarding febrile children aged 3 to 36 months, it is common practice to obtain a complete blood cell count and blood culture for patients at risk for OB. Blood cultures are obtained by trained nurses and nurse technicians after preparing the skin with alcohol, then povidone-iodine solution, which is supplied as swab sticks with 10% povidone-iodine solution, equivalent to 1% available iodine. Three swabs are used. Contact of the povidone-iodine solution with the skin is allowed for at least 30 seconds prior to venipuncture. Specimens of 0.5 mL to 1 mL of blood are drawn through a butterfly needle or freshly inserted intravenous (IV) catheter and then transferred to a blood culture bottle using a straight needle. In the early part of the study period, both aerobic and anaerobic blood cultures were sent to the laboratory (BacTAlert; Organon Teknika Corp, Durham, NC). Microbiology laboratory protocols were changed in April 1996 so that only a single aerobic blood culture (BacTAlert FAN Aerobic Culture Bottle, Organon Teknika Corp) is sent, unless the patient is deemed at high risk for anaerobic bacteremia (eg, peritonitis with sepsis). For the purpose of this study, a patient with positive culture findings from either one or both bottles was considered as having a single positive culture. The laboratory uses a continuously monitored blood culture system that detects bacterial growth based on changes in the pH of the broth. When blood culture findings are reported positive by the microbiology laboratory, the attending physician in the ED is notified of the time interval until the culture became positive and the Gram stain characteristics. Further evaluation of the patient is then based on the child's clinical status, the persistence of fever, and the attending physician's impression of whether the organism represents a pathogen or a contaminant. The attending physician, at his or her discretion, may call the child back to the ED for reevaluation, further diagnostic tests, and possible inpatient admission. Final identification and sensitivity of the organism are not available for at least 24 hours after the initial report of positive culture findings. Two lists of blood cultures were used for this analysis. One list was of all blood cultures drawn from children aged 3 to 36 months in the ED between January 1994 and October 1996, and the second list was of only cultures with positive findings identified during the same time. We reviewed the medical records of those children with positive culture findings and identified all of the children in this group at risk for OB. Specifically, inclusion criteria included any child aged 3 through 36 months with a temperature higher than or equal to 39°C and a blood culture that yielded at least 1 bacterial organism. Exclusion criteria included the following: (1) presence of an underlying illness that would place the child at higher risk for bacteremia or its complications (eg, immunodeficiency, malignancy, sickle hemoglobinopathy, congenital heart disease, or long-term steroid use); (2) the presence of an indwelling medical device (eg, central venous line or ventricular shunt); (3) diagnosis of an invasive bacterial disease (eg, pneumonia, cellulitis, or meningitis); (4) admission at the initial ED visit; or (5) maximum temperature (by parental history and in the ED) lower than 39°C. 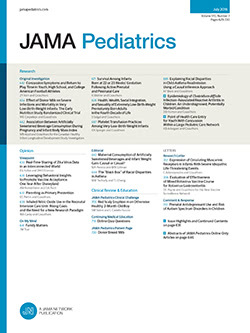 The following data were recorded: clinical and laboratory data from the first ED visit; blood culture characteristics; follow-up of positive culture findings; the number of children who returned to the ED for reevaluation; and any additional diagnostic tests and therapies performed at reevaluation, including parenteral antibiotics and hospital admission. Charges for these follow-up ED visits and admissions were obtained from the hospital's billing department and used for further calculations. The following organisms were considered pathogens: Streptococcus pneumoniae, Haemophilus influenzae type b, Neisseria meningitidis, Salmonella species, group A streptococcus, and group B streptococcus. The following organisms were presumed to be contaminants: coagulase-negative staphylococci, micrococci, α-hemolytic streptococci, nonhemolytic streptococci, and diphtheroids.20 Other organisms, such as Staphylococcus aureus and gram-negative enteric organisms, were categorized as contaminants or pathogens based on the patient's clinical picture, whether subsequent findings from blood cultures were negative, and whether the patient improved without antibiotic therapy.10 Blood cultures growing both a pathogen and a contaminant were classified as pathogens. If a determination could not be made based on the available data, the culture was classified as indeterminate. Data were analyzed using EPISTAT (EPISTAT Services, Round Rock, Tex). Continuous data were analyzed with t test, and nominal data were analyzed using χ2 or Fisher exact test. A 2-tailed P<.05 was considered significant. The study was approved by the institutional review board. During the 34-month study period, 8306 patients aged 3 to 36 months had peripheral aerobic and/or anaerobic blood cultures drawn. Of these, 491 (5.9%) grew at least 1 bacterial organism. We reviewed 485 (98.8%) of 491 medical records. Six records were not available for review. Two hundred thirty-seven of 485 blood cultures with positive findings grew contaminants. Thus, the overall contamination rate during the study period was 237 (2.9%) of 8306. The contamination rate did not differ significantly (P=.50) between the periods when the standard aerobic and anaerobic bottles were sent (2.9%) and when the single aerobic bottle was sent (2.5%). Among the blood cultures positive for bacterial growth, findings from aerobic cultures were positive in 424 (87%) of 485 cases. Thus, findings from anaerobic cultures were positive only 13% of the time when findings from the aerobic culture were negative. This proportion was the same for the overall positive rate and the contamination rate. Anaerobic blood culture bottles had significantly lower (P<.01) rates of overall positive findings from blood cultures and contaminated cultures (187 [2.8%] and 72 [1.1%] of 6624, respectively) than the aerobic culture bottles (424 [5.1%] and 205 [2.5%] of 8306, respectively). After reviewing the records, 276 (57%) of the cases were excluded (Table 1). Thus, 209 patients (43%) were eligible for analysis (Figure 1). Derivation of the 209 patients. Of 209 blood cultures eligible for analysis, findings from 123 were classified as pathogens; 85, as contaminants; and 1, as indeterminate. Table 2 gives the pathogens identified. One hundred two (83%) of 123 pathogens were S pneumoniae, while Salmonella species (11 isolates, 9%) were the second most common organism. No findings from blood cultures were positive for H influenzae type b during this time. Table 3 gives the organisms identified from 85 contaminated cultures. Of these 85, 62 grew a single organism, while 23 grew multiple organisms (17 grew 2 organisms, and 2 each grew 3, 4, and 5 organisms). Thus, a total of 120 organisms were identified from 85 cultures. Coagulase-negative staphylococci accounted for approximately 50% of the contaminants. The microbiology laboratory performed 94 tests of antimicrobial sensitivities for these 120 contaminant organisms. A comparison between those cultures that grew contaminants and those that grew pathogens is shown in Table 4. There was no statistically significant difference in mean age between the 2 groups (14.9 vs 15.6 months) (P=.48). Mean temperature at presentation (40.0°C vs 40.4°C) (P<.001), mean white blood cell count (13.7 vs 20.5 × 109/L) (P<.001), and mean absolute neutrophil count (6.9 vs 13.8 × 109/L) (P<.001) from the initial visit were all significantly lower in the contaminants group. The mean number of hours elapsed between the time the blood culture was obtained and the time it was reported as positive to the ED attending physician or fellow (time to positivity) was significantly longer in the contaminants group (33.1 vs 19.9 hours) (P<.001). Emergency department physicians documented 106 telephone calls to families and/or primary care physicians regarding positive findings from cultures. Of 85 children with contaminated cultures, 49 were asked to return to the ED for further evaluation and did so; 25 were not asked to return to the ED; and 11 could not be reached by either telephone or mail. Data regarding the telephone conversation were available for 45 of 49 children who were asked to return and for 20 of 25 who were not asked to return. The 2 groups did not differ by age (mean age, 14 vs 15 months) (P=.65) or having a Gram stain suggestive of a pathogen (18 [40%] of 45 vs 4 [20%] of 20) (P=.20). There were significant differences between those asked to return and those not asked to return for the following variables: the mean time to positivity (mean [SD] time, 28.7 [17.0] hours vs 39.2 [18.5] hours) (P=.03); the percentage given ceftriaxone sodium prior to hospital discharge from the first visit (21 [43%] of 49 vs 5 [14%] of 36) (P=.004); the percentage of those described as febrile by the parent (21 [47%] of 45 vs 0 [0%] of 20) (P < .001); and the percentage of those described by the parents as being "sleepy," "fussy," or "irritable" (10 [22%] of 45 vs 0 [0%] of 20) (P=.02). At the follow-up ED visits for these 49 patients, 102 additional diagnostic tests were performed, including 44 repeated blood cultures, 27 complete blood cell counts, 7 urinalyses, 6 urine cultures, 2 lumbar punctures, 2 respiratory syncytial virus antigen detection tests, 6 chest radiographs, 4 basic metabolic panels, 2 sickle hemoglobin solubility tests, 1 stool culture, and 1 erythrocyte sedimentation rate. Thirty-six of 49 returning patients were discharged home from the ED, 18 of whom were given a dose of parenteral ceftriaxone prior to discharge. Twelve of 49 were admitted to the hospital because of presumed bacteremia for an aggregate total of 24 hospital days. One additional patient was admitted at the second visit because of hypernatremic dehydration; this hospital stay was not included in further calculations. Those who were admitted tended to be older (19.2 vs 12.2 months) (P=.01) and have higher temperatures at the return ED visit (38.6°C vs 37.7°C) (P=.02). All 12 patients who were admitted were either persistently febrile (at home or in the ED); described by the parents as being "sleepy," "fussy," or "irritable"; or had a Gram stain suggestive of the growth of a pathogen (eg, gram-negative rods). The sample was not large enough to compare the practice patterns of different physicians. Additional charges billed to these 85 patients for these services totaled $78,904. The breakdown of these charges is as follows: $6204 (8% of total) for 94 tests of antimicrobial sensitivity ($66 per test); $24,309 (31% of total) for 36 patients seen for follow-up and discharged from the ED (mean, $675); and $48,391 (61% of total) for 12 patients admitted at the second ED visit (mean, $4033). These figures include hospital and physician charges. These charges of $78,904 represent an additional $642 for identifying each of 123 pathogens recovered in our study. If we assume that the risk of meningitis for untreated pneumococcal bacteremia is 3% to 6%21,22 and that presumptive treatment with parenteral (and possibly oral) antibiotics reduces that risk to 0.4%,21 then by identifying and treating these 123 patients with OB (83% of whom had cultures that grew pneumococci and 82% of whom were treated with parenteral and/or oral antibiotics), we prevented the development of 2.6 to 5.6 cases of meningitis. This translates to additional charges of $14,090 to $30,348 per case of meningitis prevented. These data represent hospital charges to the patients and not costs. The approximate charge-to-cost ratio in our institution is 3.3:1.0; therefore, the approximate additional cost per pathogen identified is $195, and the additional cost per each case of meningitis prevented is $4270 to $9196. Previous studies involving adult inpatients15 or a combination of pediatric inpatients and outpatients23 concluded that contaminated blood cultures contribute to increased resource utilization (length of hospital stay, laboratory tests, and antimicrobial therapy). Our study, conducted in the specific clinical context of children at risk for OB, confirms the results of these previous studies. Our results demonstrate that the hospital charges incurred in the evaluation of contaminated blood are substantial. Additional charges stemming from the evaluation of 85 patients with contaminated blood cultures totaled $78,904, of which 61% was accounted for by patients admitted to the hospital at the second ED visit. These charges must be taken into account when calculating the cost of identifying the 123 patients with pathogenic bacteremia. Lieu et al,18 in the cost-effectiveness portion of their study, estimated that for each 1% increase in the contamination rate (or decrease in the specificity of the blood culture), an additional $1303 in 1989 dollars would be spent in preventing each case of meningitis. Based on changes in the consumer price index for medical care services between 1989 (the year of the study by Lieu et al18) and 1995 (the middle year of this 3-year study), $1303 in 1989 medical care service dollars would be equivalent to $1962 in 1995 medical care service dollars.24 The overall contamination rate in our ED during the study period was approximately 3%; based on their assumptions, we would have expected additional costs of $5886 (in 1995 dollars) per case of meningitis prevented. This correlates well with the $4000 to $9000 estimated here. There are several limitations to our study. We could not easily obtain a denominator of the number of children who were seen during that time who were at risk for OB, both those who did and did not have blood cultures obtained. Thus, our estimates of the risk of bacterial meningitis were derived from previous literature rather than the actual risk in our patient population. Also, we did not record whether the blood specimen was drawn through a butterfly needle or an IV catheter because that information was not readily available. Although there is some concern that drawing blood for a culture through a freshly inserted IV catheter may increase the rate of contamination, data from Isaacman and Karasic11 suggest otherwise. Also, we could not discern to what degree individual physician practice patterns played a role in the decision to perform further laboratory tests or admit a particular patient to the hospital. This may make it difficult to generalize our results to an institution at which a fixed protocol exists for handling blood cultures that are positive for bacterial growth. An additional weakness to the study is that our monetary figures are based not on costs but on charges billed to the patients. We attempted to correct for this by dividing the total charges by the charge-to-cost ratio in our institution. This was not a formal cost analysis, however, and there are several other variables for which the costs could have been included but were not: (1) time spent by ED attending physicians contacting family members and primary care physicians; (2) follow-up visits with primary care physicians; and (3) societal costs related to time lost from work by parents. Lastly, no attempt was made to place a dollar amount on the parental anxiety generated by the suggestion that one's child had bacteria in his or her blood. Based on the findings of previous authors, we suggest the following methods to reduce costs generated by contaminated blood cultures obtained from children at risk for OB: (1) Attempt to reduce the number of contaminants through stricter adherence to sterile venipuncture technique. Isaacman and Karasic10 identified failing to wait for the povidone-iodine solution to dry on the skin (usually requiring 60 seconds) as the main culprit in higher contamination rates. (2) Increase the ratio of pathogens to contaminants by improving the sensitivity of the blood culture for recovering pathogens. This may be achieved by increasing the volume of blood inoculated into the blood culture bottle.12 (3) A clinician faced with the report of a contaminated blood culture should use knowledge of Gram stain morphology and the time to positivity to help determine whether the bacterial growth represents a pathogen or contaminant. Kornberg et al20 demonstrated that a culture that grows organisms after 24 hours and has a Gram stain showing gram-positive cocci in clusters or gram-positive rods is overwhelmingly likely to be a contaminant. (4) Molecular diagnostic techniques, such as polymerase chain reaction, may be able to more specifically distinguish between pathogens and contaminants.25-27 This may be accomplished at the time the culture is drawn or when the culture becomes positive for bacterial growth. Clearly, in an age during which H influenzae type b disease has declined dramatically and during which concerns mount over increasing antimicrobial resistance, the approach to care for the child at risk for OB should be reevaluated, and the costs of contaminated blood cultures must be taken into account. Accepted for publication October 18, 1999. Presented in part at the Annual Meeting of the Ambulatory Pediatric Association, New Orleans, La, May 5, 1998. We gratefully acknowledge the assistance of Joseph Campos, PhD, Director of Microbiology and Laboratory Informatics, Children's National Medical Center, Washington, DC. Corresponding author: Gershon S. Segal, MD, Division of Pediatric Emergency Medicine, Johns Hopkins University School of Medicine, 600 N Wolfe St, CMSC 144, Baltimore, MD 21287-3144 (e-mail: gsegal@jhmi.edu).